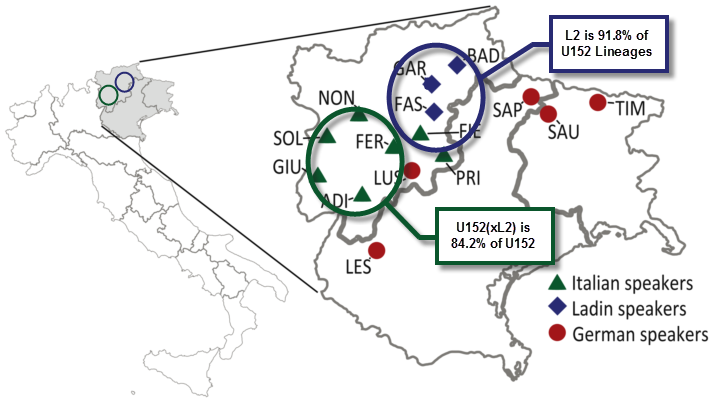 As was confirmed by Boattini et al (2013), U152 has its frequency peak in northern Italy. But, Boattini’s data also showed an interesting pattern – one where U152 was less frequent in Adriatic North East Italy, but when it did occur, it was more likely to be made up of L2 lineages. Coia’s data now gives us some further clarity on the matter. – Coming in close to Brescia’s 51.3% (per Boattini), Val Badia is a close second in overall U152 frequency with 50.0%. However, what constitutes U152 is very different between the two areas, with Brescia being very high in U152(xL2) (38.5%) and Val Badia dominated by L2+ (47.7%). – It’s tough to say if the current U152/L2 divide is a product of the post-Roman linguistic breakup of Latin (Italian/Ladin) or more of a north-of-the-Alps / south-of-the-Alps division related to Copper/Bronze Age populations. Z36 seems to stretch from western Switzerland to Tuscany and L2 from eastern Switzerland to South Tyrol. As a point of reference, Bavaria also has a higher percentage of L2 (Rebala et al 2012) at 63.4%. Much of the eastern Alpine areas have cultural ties from the Central European Bell Beaker province (Begleitkeramik), continuing through the Arbon and Polada Cultures and through to the Inneralpine Bronzezeitkultur (Inner Alpine Bronze Age Culture). Of course, we still wait for Z36, Z56 and PF6658/Z193 and their subclades to make their way into academic studies to give us a clearer picture of what is an interesting, albeit complex distribution of U152.